Allow me to introduce myself to the readers of the UCLA Library's Preservation Blog: my name is Siobhan Hagan, and I am the UCLA Library's new Audiovisual Preservation Specialist (full disclosure: I started in July of 2011, so I am not as "new" as you might think). In Latin, "audio, video, disco" means "I hear, I see, I learn". I love obsolete things, like Latin and Umatic videocassettes, so I strive for each and every day in my job to include some element of a Disco: to remember that learning is fun, especially in the light of a darkened room with flickers and strobes of unique moving images and sounds. 1. Getting to know the UCLA Campus and Library ins and outs: still working on this one! I must say that I have totally mastered the BruinBus. And getting to know all the great people here has probably been one of my favorite parts: everyone was so excited to have me here--I had a great welcome. 2. I was able to attend the Association of Moving Image Archivists' (AMIA) The Reel Thing and Digital Asset Symposium (DAS). It was my second Reel Thing and my first DAS. It's been great to be in LA where the AMIA organization is based for these and other events! 3. Scavenging for and purchasing AV equipment and supplies: sometimes people just give it away, and sometimes it costs a large amount of money. The ultimate goal is to have in-house playback and reformatting capabilities for select audiovisual formats. 4. I went to the AMIA annual conference in Austin, Texas (this was my 4th). I visited lots of places with AV collections in Texas and then the east coast (my home sweet home), including NARA, Library of Congress in Culpeper, the Smithsonian Institute Archives, and the New York Public Library, just to name a few. My main goal from this trip was to learn the failures and successes that these places had with their AV preservation programs so that the UCLA Library could learn from others' mistakes and achievements. 5. Working with outside vendors on audio reformatting projects: this has taken up a huge amount of my time, but it has been a lot of fun to get my hands on the great collections. Stay tuned for some audio from the Perlich, SOUL Magazine, Newquist, and Ojai Music Festival Collections coming soon to our Digital Collections! 6. 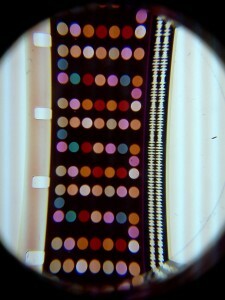 Co-wrote a National Film Preservation Foundation Basic Preservation grant proposal for a film from the Synanon Collection. We should find out if we got the funds in the summer, so I will keep you posted. 7. All of this preservation reformatting has led to many discussions regarding proper (and a lot of it) digital storage, metadata, and dissemination. This was already an issue being dealt with in the library upon my arrival, but I brought it to a whole new level since digital AV files are much larger than digital photos or documents. 8. Working on developing ares of cooperation, selection, capture, preservation, and access of live events that happen at the library such as lectures, workshops, performances, and other types of meetings. The plan right now is to start with the capture of events at the freshly renovated Young Research Library, and then use that experience to guide the performance capture and preservation across the library and the UCLA campus. 9. Visited the San Francisco area to visit places with AV Collections with the same goals in mind as my previous Texas/east coast trip. I also attended the Personal Digital Archiving Conference at the Internet Archive and got ridiculously excited by all of the television news preservation that they are doing there! I probably left some things out, but you get the picture: things are happening at the UCLA Library with AV Preservation!